Developing social skills is a crucial element of early learning and teaches kids effective communication, how to recognise and express feelings, and how to navigate their way through social interactions. Kids can practise these and other skills in our social skills worksheets that include coloring expressive faces, creating paper dolls, differentiating between good and bad manners, and reading and creating maps. Is this person feeling happy or tired? 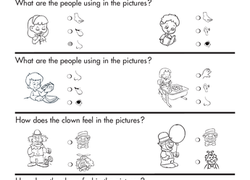 Your child can decide as he adds some colors to this emotions coloring sheet! Is this person feeling mad or frightened? Your child can decide as he adds some colors to this emotions coloring sheet. Is this person feeling tired or frightened? Your child can decide as he adds some colors to this emotions coloring sheet. Learn a few new words to describe emotion with this funny coloring page! Your child can decide whether this person is feeling surprised or sad. With one eyebrow up and one eyebrow down, this face is showing a clear emotion. Can your child figure out which one? Learn a few new words to describe emotion with this funny coloring page! Your child can decide whether this person is feeling scared or silly. This boy has a crooked frown and half-closed eyes. What word describes how he feels? Your kid will colour this face and choose an emotion word to describe it.